Holy Trinity had its beginning when a small community was established in 1892 as St. Vladimir’s. The first services were held in a house on North Noble Street and later in a rented home on Armitage (then Centre) near Racine. The community then consisted of a small group of Orthodox immigrants from Carpatho-Russia and Galicia. In its early years of existence, the cathedral parish served as a catalyst for the establishment of several other Orthodox parishes in the Midwest. It has served as a means of uniting Orthodox immigrants in the Chicago area, providing the guidance and leadership for several of the Midwest’s Orthodox parishes. It is the See cathedral of the diocese of the Midwest of the Orthodox Church in America. In 1895, Fr. John Kochurov, a young and energetic priest from St. Petersburg, Russia, arrived to care for the Chicago parish and began to make plans for a new church and rectory. Funds were granted from Russia’s Holy Synod and Tsar Nicholas gave a personal gift of $4,000 to the building fund. Attracted by a model Orthodox chapel exhibited at the Columbian Exposition in 1893, many wealthy Chicagoans gave additional gifts, and the search for an architect began. By the time Louis Henry Sullivan was asked to design the cathedral and parish structures, he had earned a reputation for being one of America’s most renowned architects. In designing this church, Sullivan undoubtedly studied the designs of numerous contemporary Russian churches, however, archival references show that a small wooden church in the village of Tatarskaya in Siberia served as inspiration for his final design. The cornerstone for the new church was laid on March 31, 1902, and the new structure was consecrated by Bishop Tikhon of the North American mission of the Russian Orthodox Church on March 25, 1903. (Bishop Tikhon upon his return to Russia was elected as patriarch of the Orthodox Church of Russia and later died as a confessor to Christ.) Holy Trinity was designated a cathedral in 1922. It was listed on the National Register of Historic Places in 1976 and designated an official City of Chicago Landmark in 1979. Today, Holy Trinity Cathedral continues to be dedicated to serving the people of God in the spirit of Christian love and witness. Holy Trinity does not confine its services to those of Slavic descent. A growing number of converts have been received into Orthodoxy at our cathedral. Restoration is currently in progress. 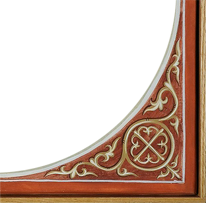 Over the years, some deviation has occurred from Louis Sullivan’s original design. A desire to return to his intended design, as well as provide a more useful space for both the parish and larger community, has moved the parish to solicit architectural plans for a complete restoration and remodeling. These plans would incorporate recommendations offered in a 2002 building study from the firm of Johnson-Lasky. To date, a new canopy over the front door, a new slate roof, repairs to the dome windows and stucco, metal cladding of the two cupolas, as well as the installation of a new heating system, have been completed. The parish has begun fundraising efforts to help cover the cost of the restoration work (estimated at approximately $2,000,000) to include restoration of the bell tower railings to the original detailed design, new metal work/detailing around windows and replacement of the existing stucco. 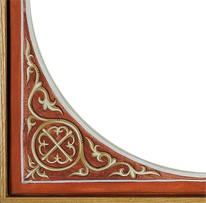 To learn more about our restoration work, please visit www.friendsofholytrinity.com. We, the parish family of Holy Trinity, feel blessed to have been given a house of worship of such spiritual and architectural importance. Being aware of a structure so magnificently designed, but most importantly, a temple where saints have walked and are among that great cloud of witnesses, we live in constant awe and gratitude for this gift. We realize however, that it is not ours to keep to ourselves, but as good stewards, to maintain and preserve it for those who are yet to follow. We must accept this responsibility and commit ourselves not only to the proper restoration of this House of God, but also to constant examination of how those in our cathedral parish and also those in the community are served and edified. Holy Trinity is fortunate to have had St. Tikhon, St. John of Chicago, St. Alexis of the Midwest, St. Alexander Hotovitsky, St. Sebastian, St. Raphael of Brooklyn and Metropolitan Leonty of blessed memory, worship within its sanctuary. St. John Kochurov served at Holy Trinity and was instrumental in its construction. While serving St. Vladimir’s, our holy father John also devoted great efforts toward the establishment of other churches. He performed the first services for the Orthodox community on Chicago’s south-west side which eventually would become Archangel Michael Orthodox Church. Beyond the immediate vicinity of Chicago, St. John was also instrumental in forming numerous other parishes including Nativity of the Virgin Mary in Madison, IL (1900), Three Saints in Streator, IL, St. Nicholas in Joliet, IL (1907), in addition to Buffalo, NY and Heartshorn, OK. He also worked in the field of translating religious texts into English, providing for the future of a Church that would not be populated predominantly by immigrants but English speaking native-born Orthodox. His administrative abilities, put to use by founding parishes and serving as Dean of the central states, were also helpful in helping to organizing the historic first All-American Sobor, convened by St. Tikhon at Mayfield, PA in 1907. In 1907, he returned to Russia and due to his skills in education he was assigned to teach catechism in the schools of Narva, Estonia, where, as in America, the Orthodox were a minority. In 1916, he was assigned to St. Catherine’s Cathedral in Tsarskoye Selo (near Petrograd), where his skillful and moving sermons attracted many people. On October 30, 1917, as the town was under attack by the Bolshevik forces during the turmoil of the Russian Revolution, people thronged to the churches seeking consolation. The clergy conducted a prayer service and procession throughout the town to pray for peace. The following day, the town was seized by the Bolsheviks and St. John was arrested, taken to the outskirts of town and shot to death. He thus became the first clergy martyr of the Russian Revolution in 1917. Several days following his death, St. John was buried in the crypt of St. Catherine’s Cathedral, which was later demolished some years later. On December 4, 1994, St. John was canonized by the Council of Bishops of the Russian Orthodox Church. In Russia, he is venerated as the first of the new martyrs of the 20th century, while in America, he is additionally remembered as a missionary and inspired preacher. 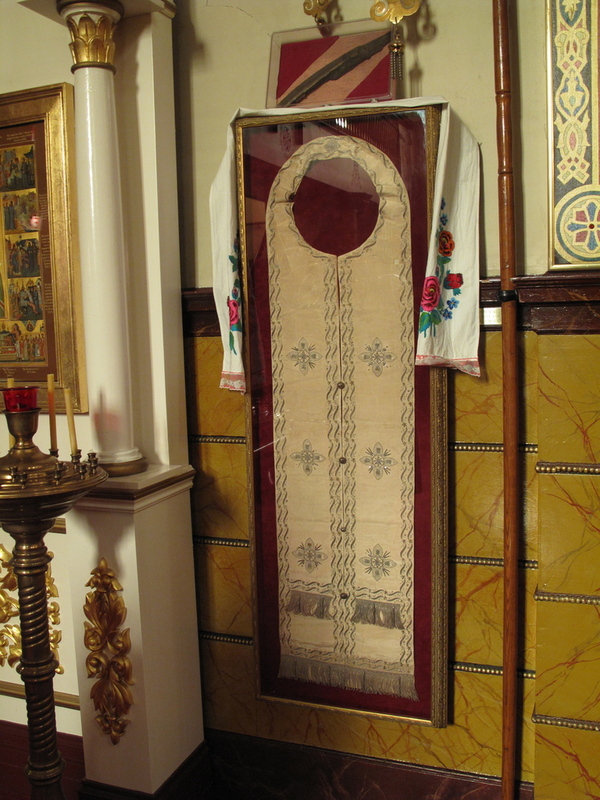 An Epitrachelion that was worn by St. Tikhon is on display in the cathedral. Holy Trinity Cathedral was consecrated in 1903 by St. Tikhon, Patriarch of Moscow and Apostle to America. Click here to learn more about this saint.